I'm a big fan of blue black ink. I'm also one of those people who puts way too much thought into how well an ink color coordinates with the pen it's in. As a result, I've set out on a quest to find the perfect "blue black pen." 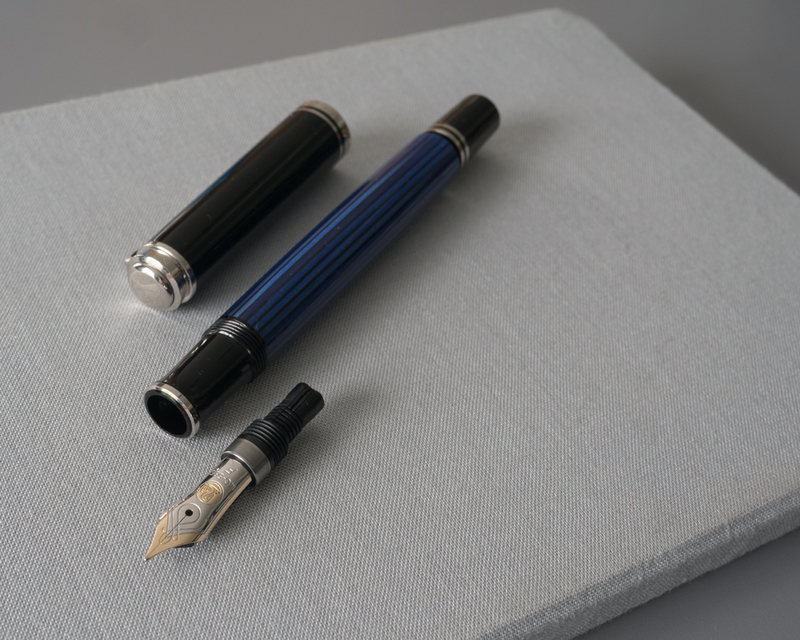 One of the first potential candidates to catch my eye was the Pelikan Souverän M405. I tend to favor pens with minimalist designs, so the M405 was my first "flashy" fountain pen acquisition. I had high expectations for how attractive this pen would be, and it delivered. It's quite stunning. One thing that jumped out at me right away is that the M405 is a definitely a smaller pen. I knew going in that Pelikan pens start small and increase in size as you move up the model chain, but I was still a bit surprised by just how light and small the M405 is. This is not so much a negative judgement as something to be aware of. While it has boardroom looks, it's really not much bigger than a pocket pen. 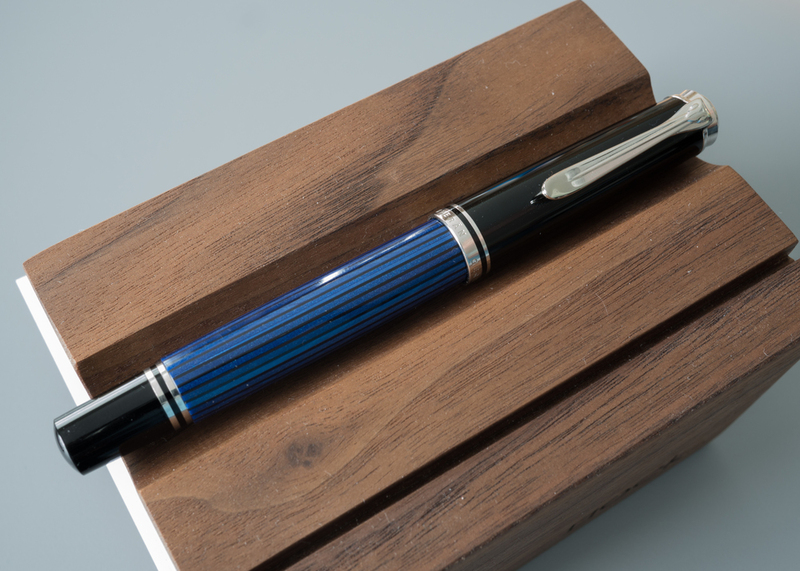 One of the pen's signature attributes is its black and blue striated barrel. 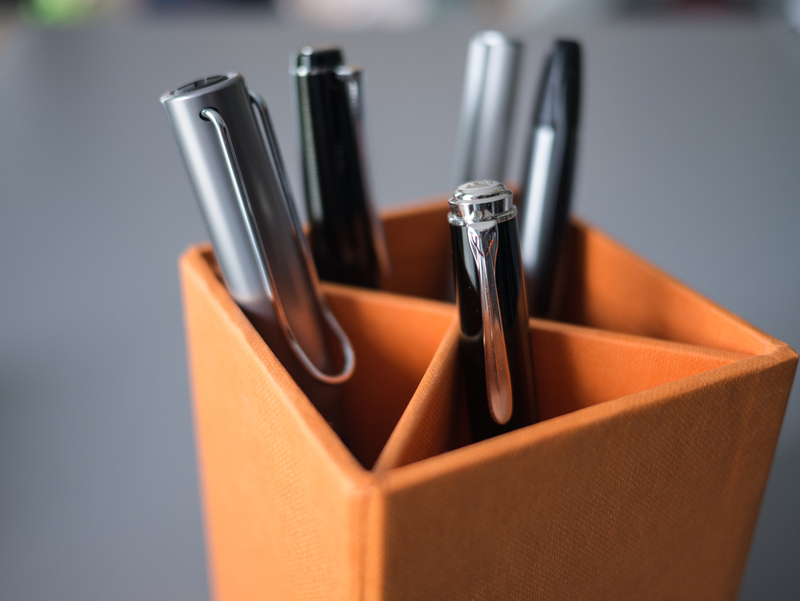 It's a distinctive look that gives the pen some personality without going over the top. 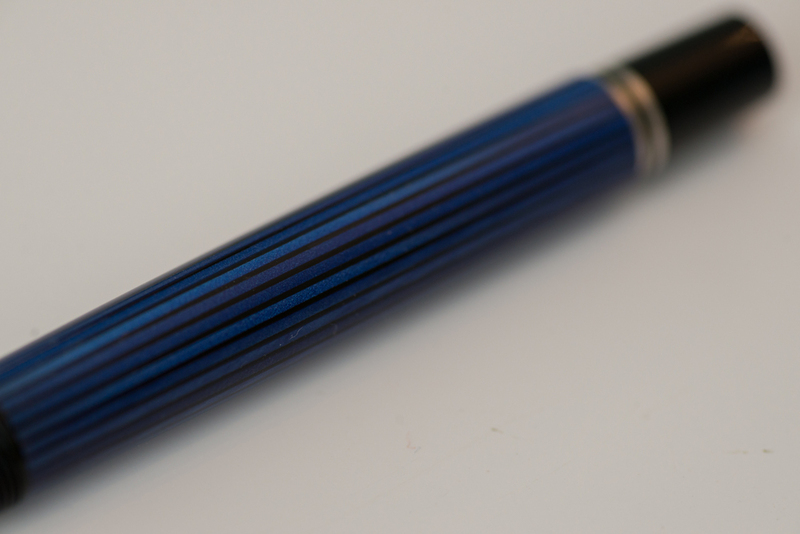 And, of course, no description of this pen is complete without highlighting the stunning 14k gold two-tone nib. The nib material and intricate engraving leave no doubt that this is a quality writing instrument. 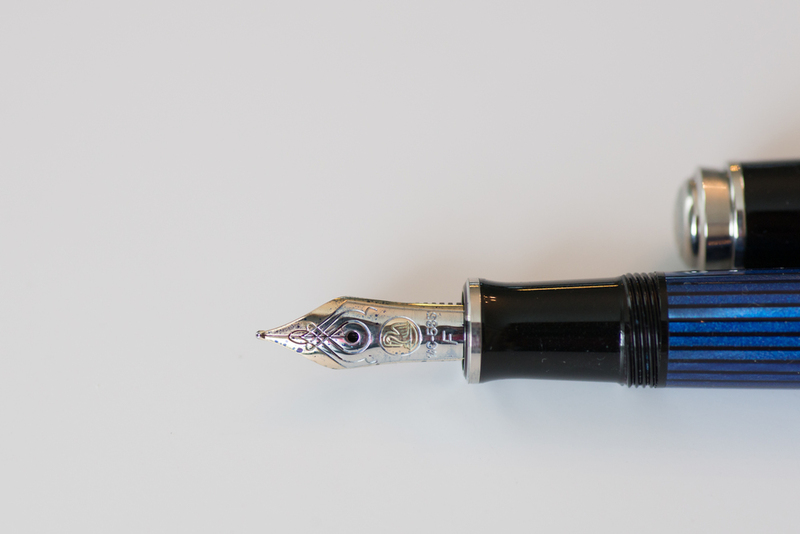 I'm not really a fan of gold-colored nibs and furniture on pens, but the two-tone gold and rhodium nib on an otherwise silver-accented pen was a nice way for me to dip a toe in the water. If you happen to be a gold fan, the M405 has a sibling, the M400, that is essentially the same pen with gold accents. 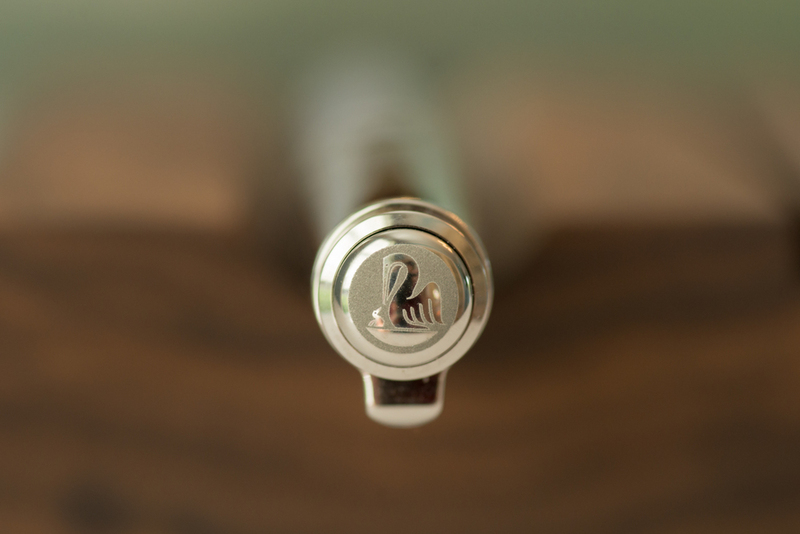 The M405's cap and finial include some lovely details that are distinctively Pelikan. The M405 is a piston filler, and the mechanism has a premium, well-designed feel. 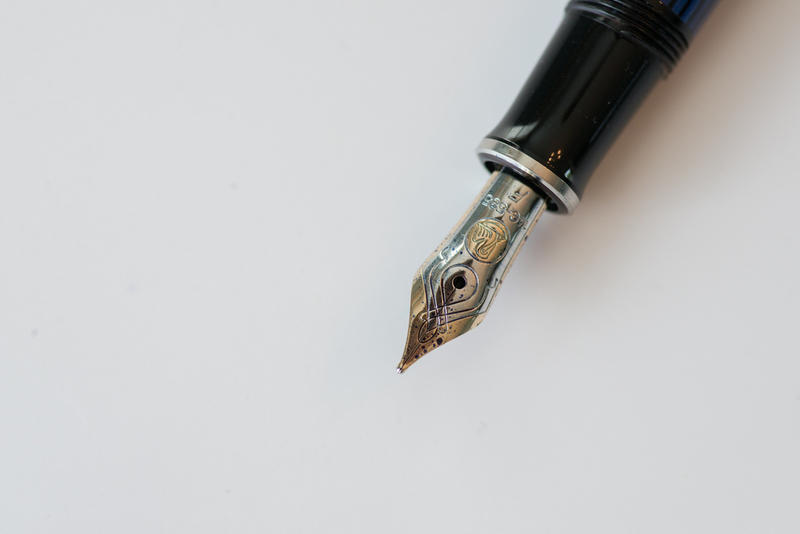 While the pen is small, it has the ink capacity to go for quite a while between fills. While it's not obvious to the casual observer, the barrel is actually slightly translucent, which is convenient for monitoring ink level. The fit and finish on the pen is top notch. It exudes German precision and quality. That said, it's such a pretty pen that I can't help but baby it a bit. I had read and heard many raves about Pelikan nibs, and I decided to up the ante with my first Pelikan purchase by jumping over the steel-nibbed M205 to Pelikan's gold nib entry point. As a result, my expectations were very high. I actually found the M405 writing experience a bit disappointing at first. It wasn't bad per se. It just didn't live up to my expectations. It felt slightly scratchy, and I also experienced a bit of skipping. This really detracted from my enjoyment of the pen early on. I stuck with it though, and the issues I was having worked themselves out with use. I think it was a combination of me adapting to a smaller "sweet spot" than I was accustomed to and the nib smoothing out a bit with use. In any case, it went from disappointing to delightful without any special effort on my part. I went with a fine nib, and it lays down a line that is much wider and wetter than other German fine nibs from the likes of Lamy and Kaweco. This makes it a little less versatile in terms of paper choices. Overall, I really appreciate the fact that it has its own unique style, and I definitely reach for it when I feel like laying a generous portion of ink down on the page. What you give up in practicality, you get back in fun. Up to this point in my fountain pen journey, I haven't focused too much on pairing inks and pens from the same manufacturer. Pelikan has changed this for me. I love the M405 and the Pelkian Edelstein inks so much more together than I do individually. They feel perfect together. The M405 is relatively straightforward to clean. 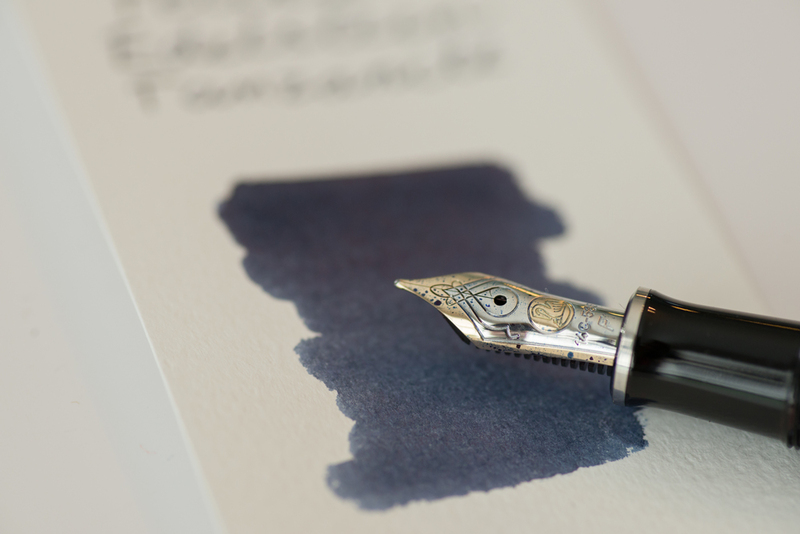 I usually start off with the standard piston twist in water dance to get the bulk of the ink out of the nib and feed. However, it is quite simple to unscrew the nib from the body for a more thorough cleaning of the nib and ink chamber. The nib isn't quite as easy to flush with a bulb syringe as some of my others, but by and large cleaning is pretty painless. The M405 is a well-made pen that writes extremely well. However, I don't really consider it a great value. The street prices vary widely for this pen, but I generally see it listed in the $270 to $320 range. From a value perspective, the M405 is a hard pen to size up. When I account for the spectacular nib and overall quality of the pen, the price is defendable. 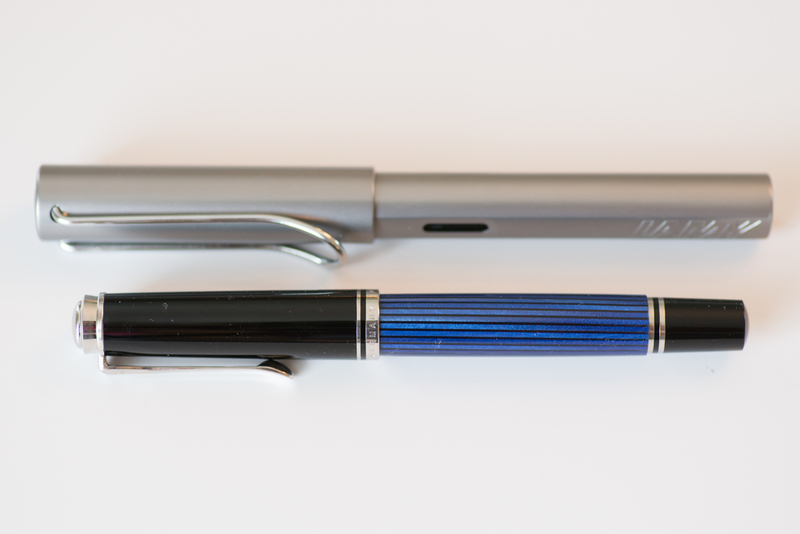 However, when you consider that you could pick up a Pilot Vanishing Point AND a Lamy 2000 for about the same money, the M405 feels a bit overpriced. My perspective would likely be a bit more positive on this point if the pen had performed flawlessly for me right out of the box. 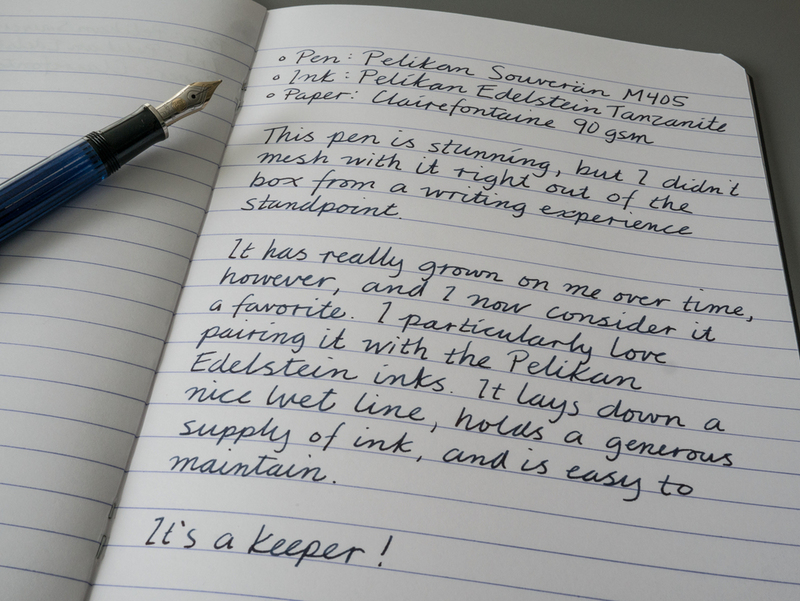 After a disappointing start, the Pelkian Souverän M405 has won me over and become one of my favorite pens. It's an attractive and distinctive pen that is a pleasure to write with. It comes at a premium price point for what it is. But then again, logic and sound financial decisions aren't really hallmarks of the fountain pen hobby anyway. 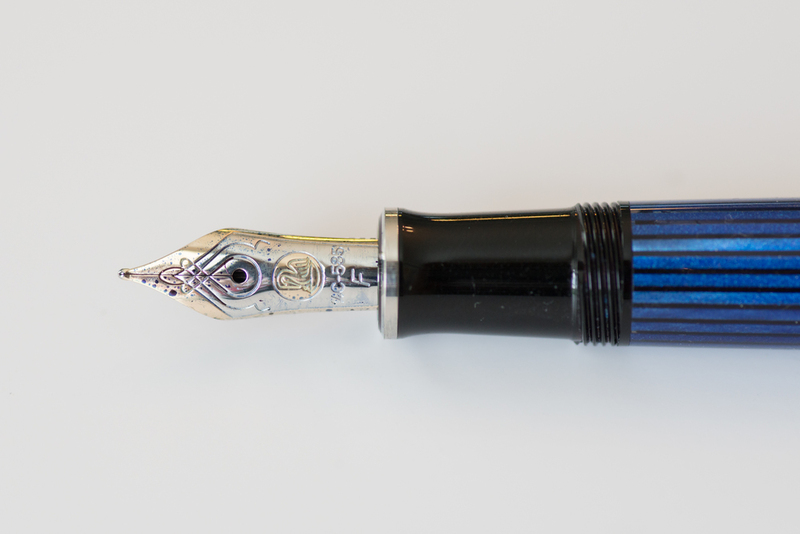 I'm not sure that I'm ready to declare my quest for the quintessential blue black pen complete, but the blue M405 makes a compelling case.